countryside at night. Unfortunately he was proclaimed unfit to rule – or some say mad – and drowned together with his psychiatrist in Lake Starnberg in 1886. Our guide on the bus trip had a more salacious version of Ludwig’s life, straight from Wikipedia. 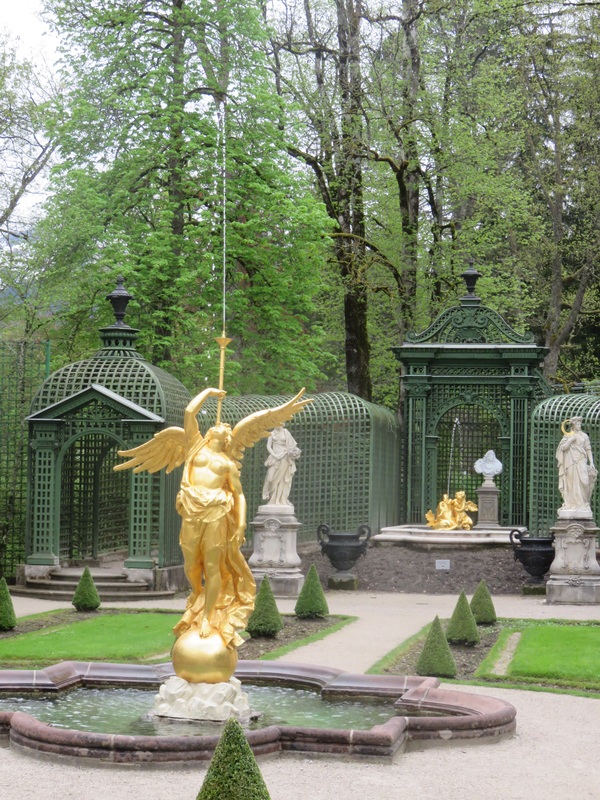 Our first stop was LInderhof, decorated in Baroque style. The rooms were almost completely covered in gold leaf, with white, pink and black marble forming the structures. Beautiful tapestries in the pale blue of the Bourbon era and both Meissen and Nymphenberg porcelain completed the furnishings and decoration. One room with concave mirrors gave the impression we were looking into a vast hall of gold, mirrors and tapestry. The fireplace was completely surrounded with lapis lazuli stone. We were not allowed to take photos inside and were impressed that soft furnishings which were 150 years old were in such good condition. Ludwig spent the last years of his life in this Schloss and it is the only castle that was completed. We drove through spectacular mountain scenery, with peaks still capped with snow. 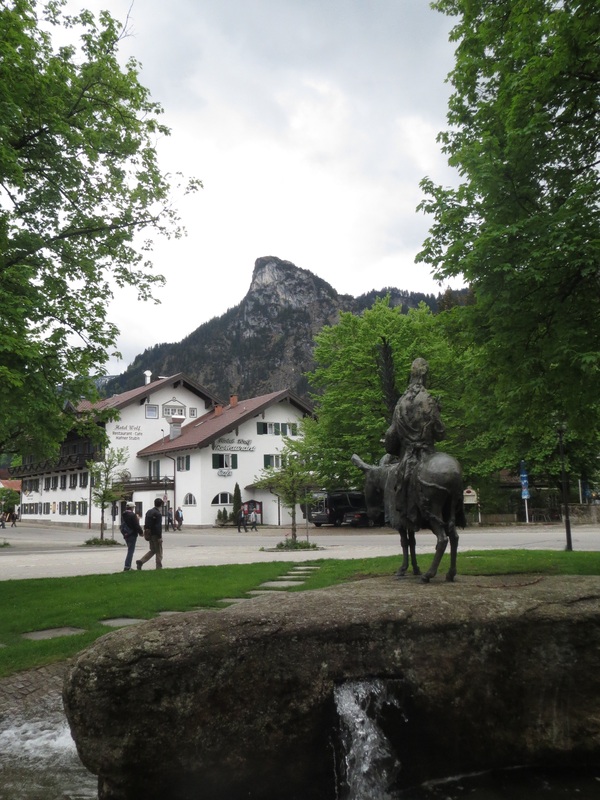 As we approached Oberammergau, evidence of air-brush paintings on the buildings became evident. 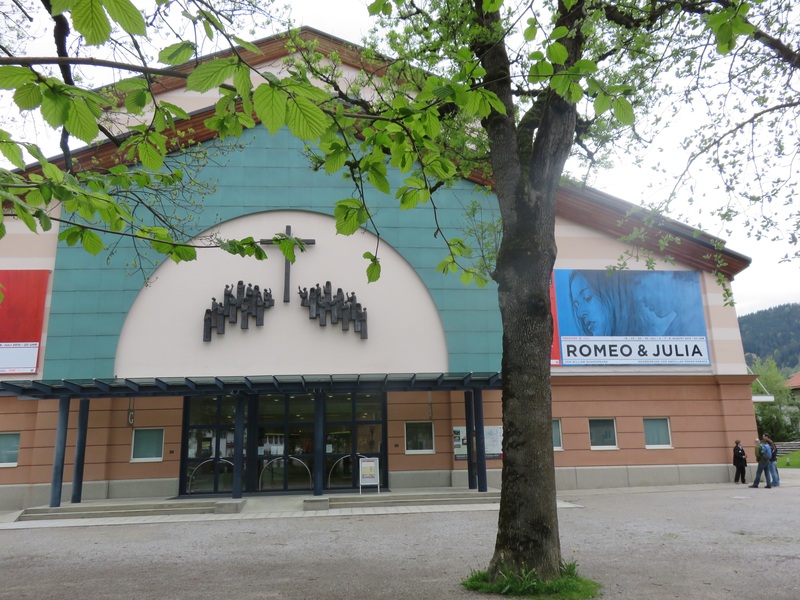 Being the heart of Catholicism in Germany, Oberammergau holds its famous passion play every 10 years, a tradition harking back to the 1600’s, when the town was spared from the plague. Oberammergau is also famous for its wood carvings and we managed to find a carver working in his studio, on linden wood. The majority of his work had religious connotations. Above Oberammergau township a huge Spitze or peak was topped with a crucifix, a memorial for the climbers who had not made it and on further inspection, a cross in dark rock part of the rockface below. to the Schloss. We could have opted for a coach ride but it was a pleasant if steep stroll through the woods. A further hike to the Marienbruecke, a suspension bridge slung across a precipitous gorge gave us the magic view, so chronicled in fairytales and Walt Disney cartoons. 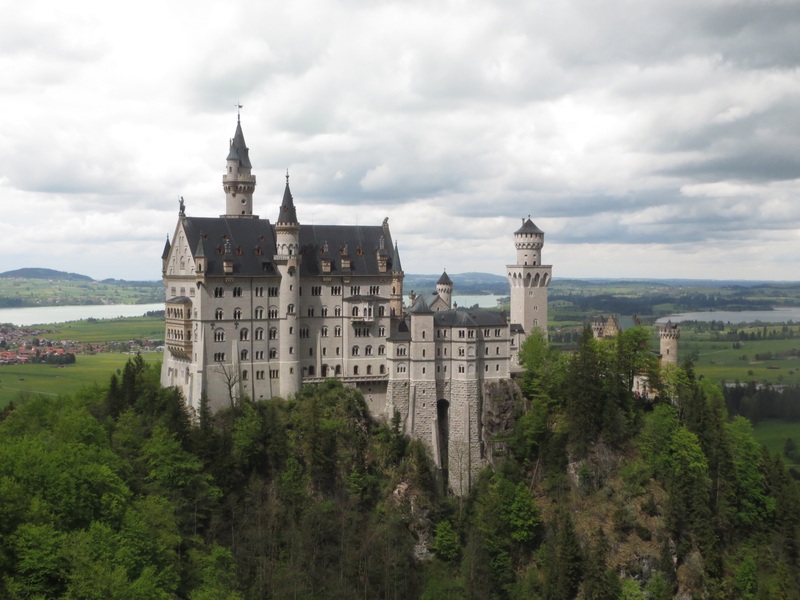 Neuschwanstein – new swan stone – is a four story castle built of brick and limestone and was never finished. Trades and craftsmen worked for 14 years on this feat of 19th century engineering and Ludwig, for all his fantasies, was forward thinking enough to install running water and a flushing toilet in his bedroom and what was considered the first telephone in Germany. The building is dedicated to medieval knights, so apparent in Wagner’s operas. The ‘Singenhall’ on the 4th level had the dimensions of a large church, as well as the acoustics. It was never used in Ludwig’s time but is now used for choral and other works. 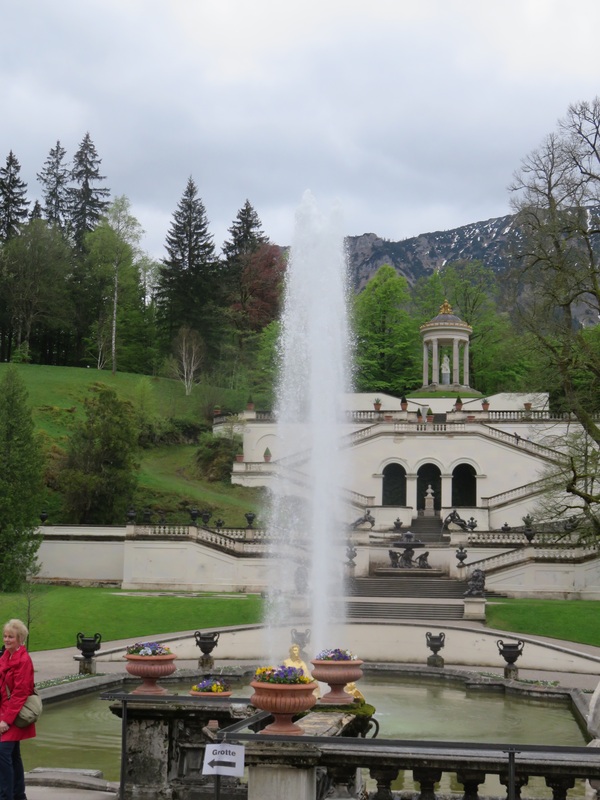 The impression was quite different to Linderhof, with its gold and brocade; Neuschwanstein was all stone, marble and intricately carved wood. Having climbed up and down 267 steps we exited, without guide via the kitchens in the bowels of the castle. 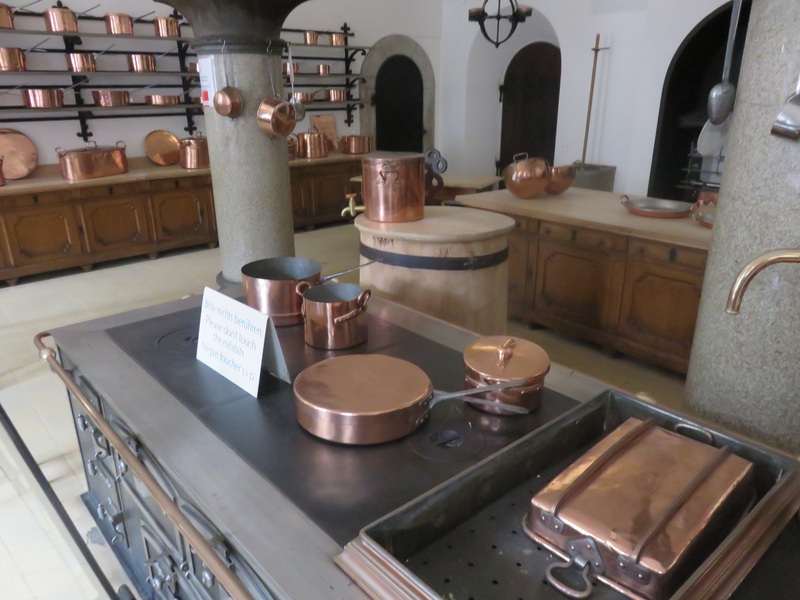 Huge wood ovens, vast copper tureens and pots and metal alloy moulds for elaborate dishes and desserts were on display. Ludwig mostly dined at night so the head Cook had his own office, complete with bed!, where he organised the delivery of food, menus, shifts of cooks and waiters. A huge lift managed by pulleys connected the kitchen to the rest of the castle. We reeled out of this incredible place, impressed as much by the ingenuity of construction and operation, as the visual effect of the castle hanging over the valley, trying to imagine how this would look in winter and autumn. 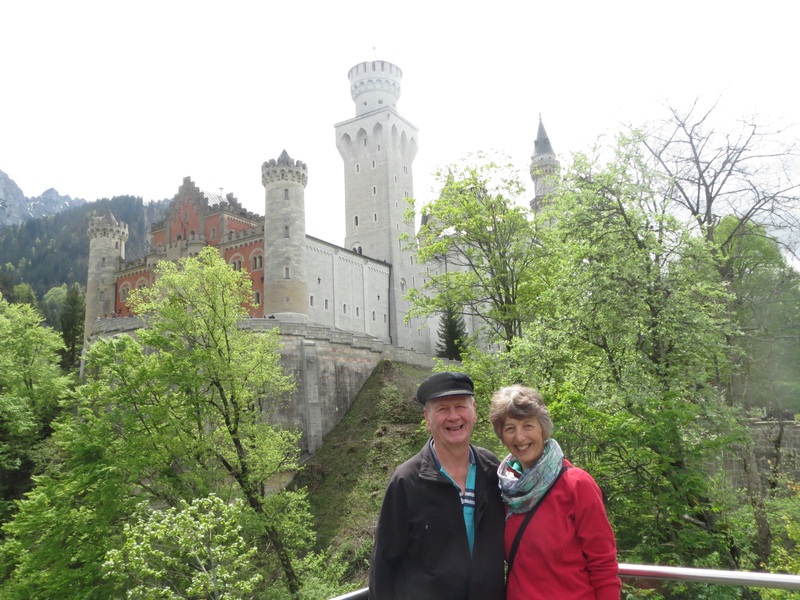 The Bavarian state, who now manage the castles, shows 7000 people/day through Neuschwanstein. It is open 363 days/year.